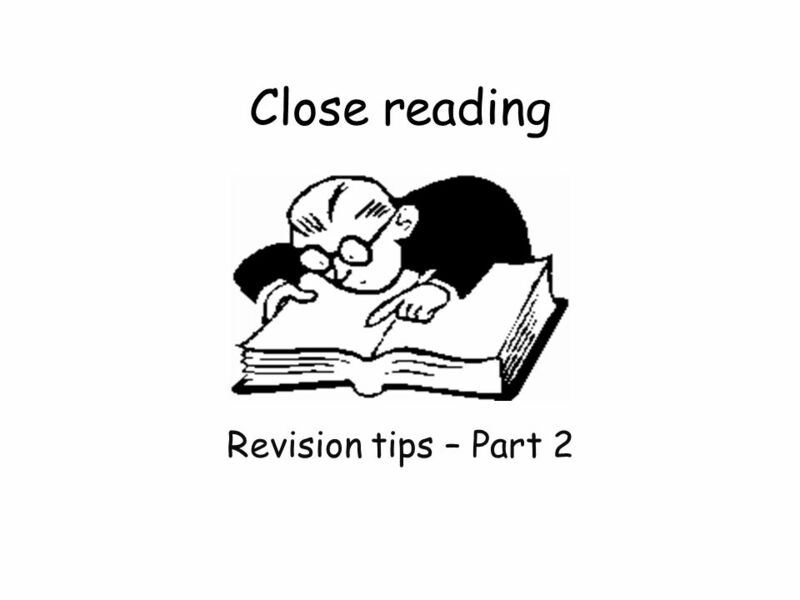 Close reading Revision tips – Part 2. 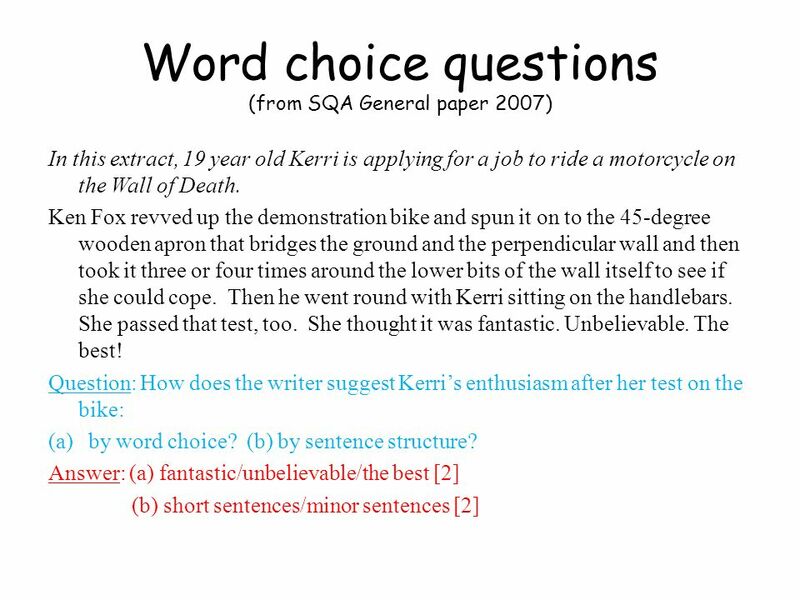 Reminder Apart from understanding and sentence structure questions, you will be expected to answer questions on. 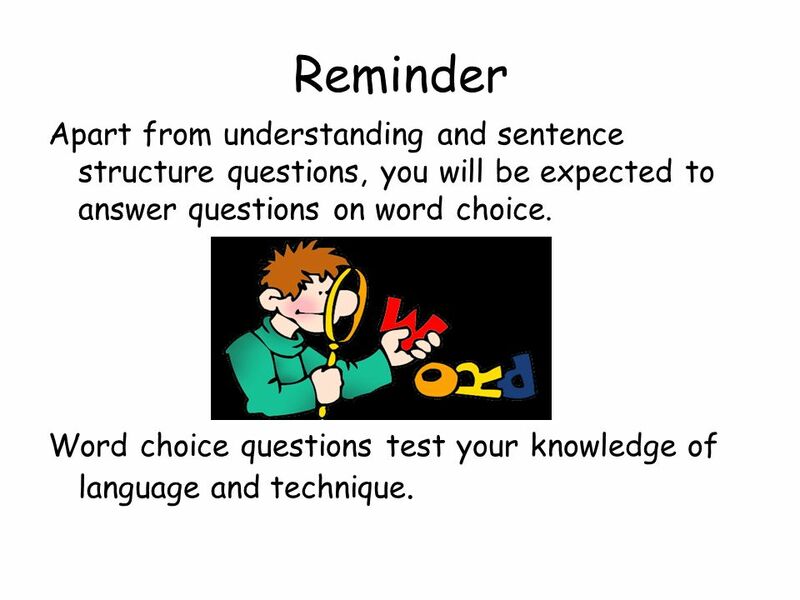 2 Reminder Apart from understanding and sentence structure questions, you will be expected to answer questions on word choice. 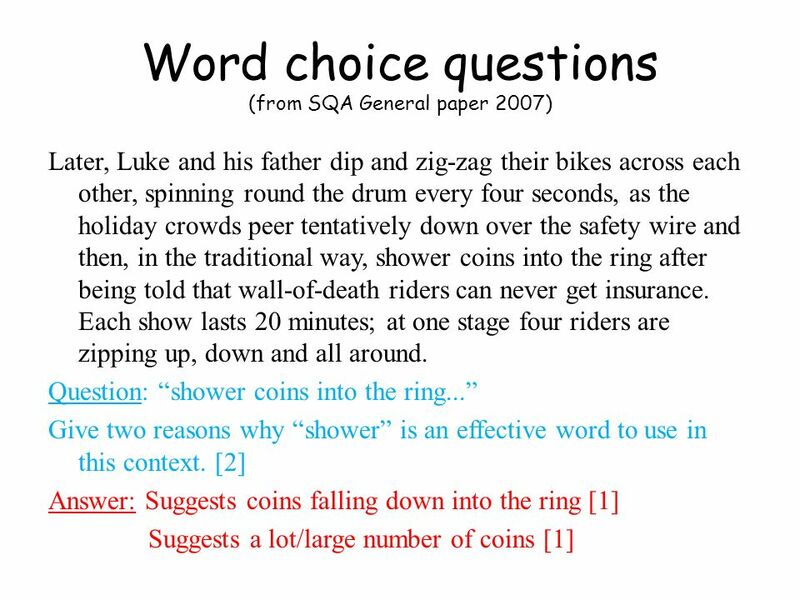 Word choice questions test your knowledge of language and technique. 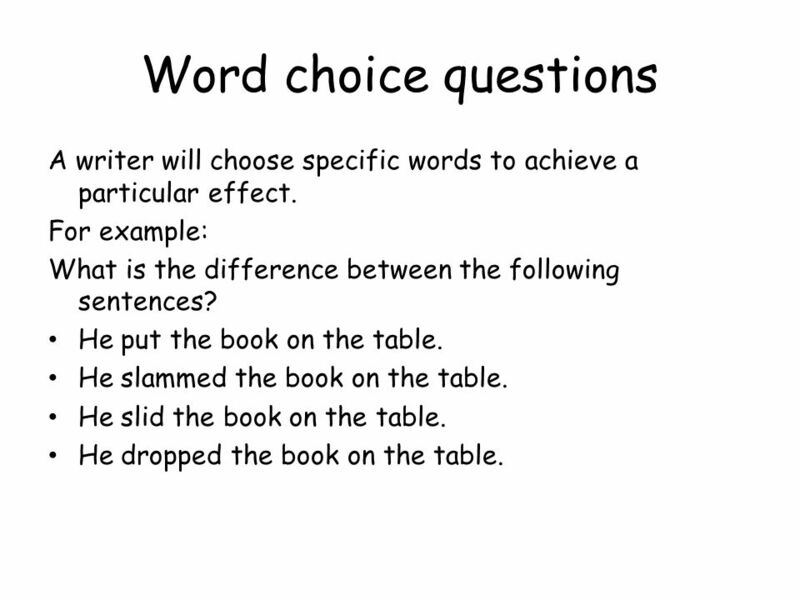 3 Word choice questions A writer will choose specific words to achieve a particular effect. For example: What is the difference between the following sentences? He put the book on the table. He slammed the book on the table. He slid the book on the table. He dropped the book on the table. 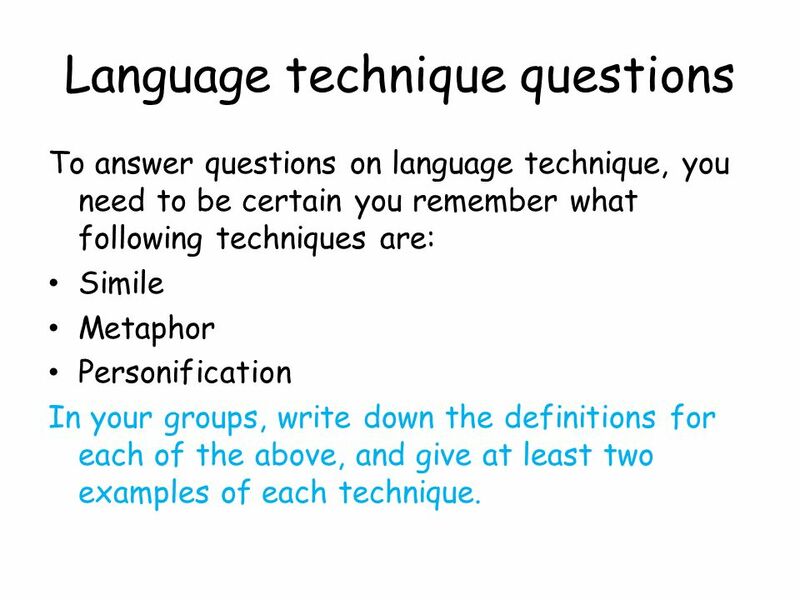 8 Language technique questions To answer questions on language technique, you need to be certain you remember what following techniques are: Simile Metaphor Personification In your groups, write down the definitions for each of the above, and give at least two examples of each technique. 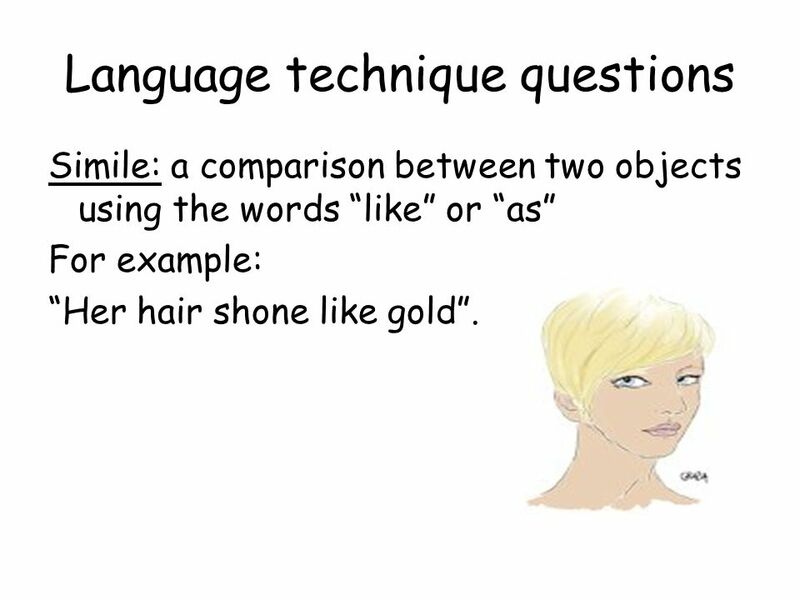 9 Language technique questions Simile: a comparison between two objects using the words like or as For example: Her hair shone like gold. 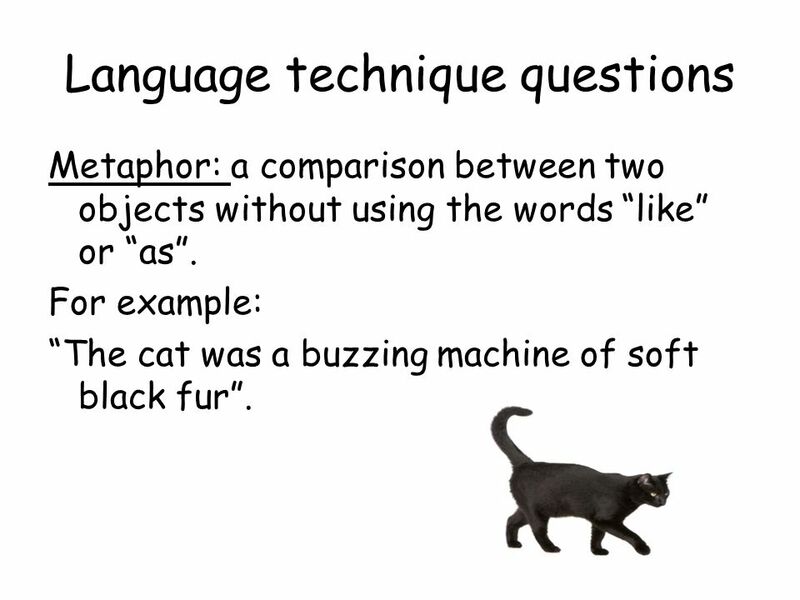 10 Language technique questions Metaphor: a comparison between two objects without using the words like or as. For example: The cat was a buzzing machine of soft black fur. 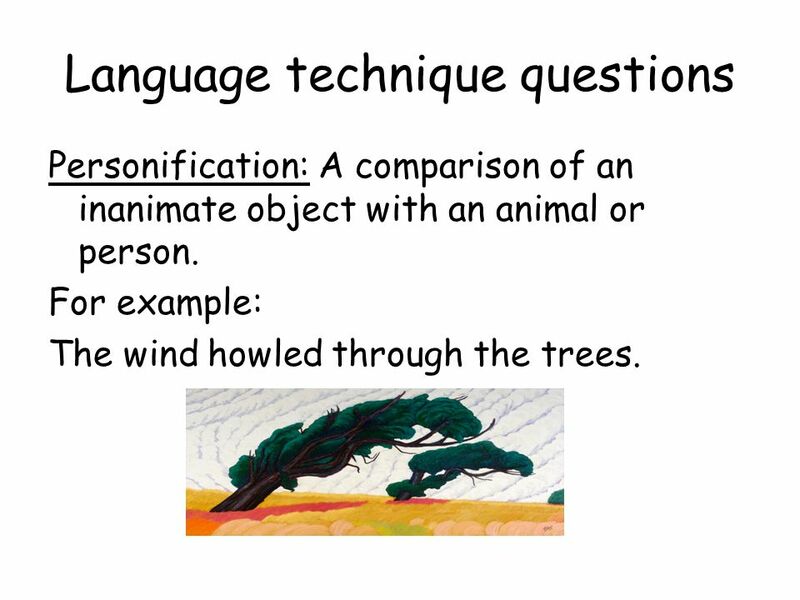 11 Language technique questions Personification: A comparison of an inanimate object with an animal or person. For example: The wind howled through the trees. 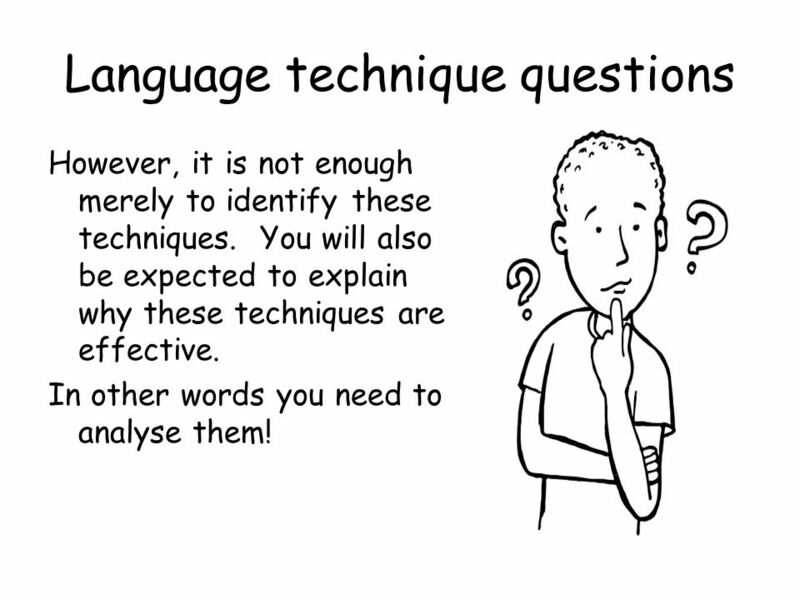 12 Language technique questions However, it is not enough merely to identify these techniques. You will also be expected to explain why these techniques are effective. In other words you need to analyse them! 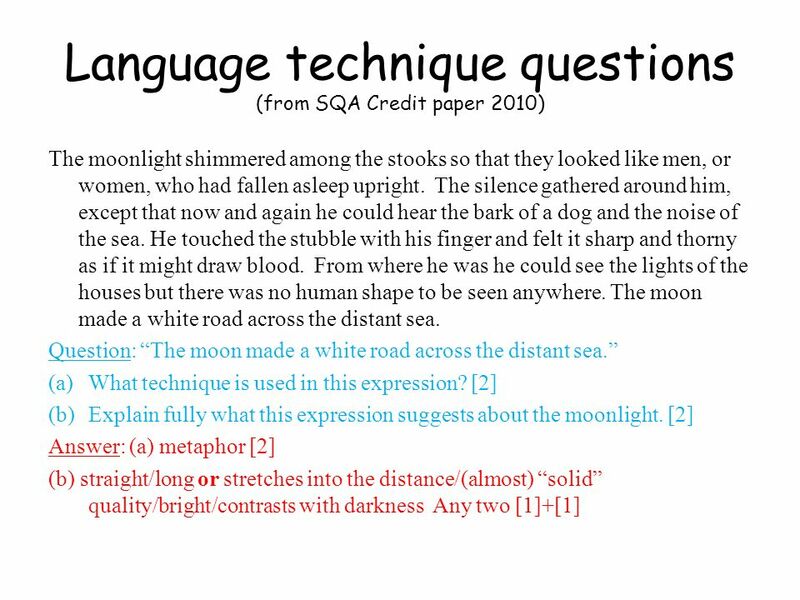 13 Language technique questions (from P&N General paper 2008-2009) All the stalls were kept in the market yard at the back of Tescos, nudging and elbowing in the wind like kids lined up in the playground. The owners had their names burned into them with pokers or sprayed on with aerosol, and my first quick look as I ran round the corner was always to see if Coxs was in there. Most of his pitch was set up off the back of his van, reversed up tight to the High Pavement, but he always had enough stuff to overflow on to his hand stall. Question: a)Write down the simile or comparison which describes how the stalls were kept in the market yard. b) Explain what is appropriate about this comparison. Answer: a) nudging and elbowing in the wind like kids lined up in the playground. b) It shows how close the stalls were together/packed tightly/in a row/jostling for space. Any one attempt to show awareness of image. 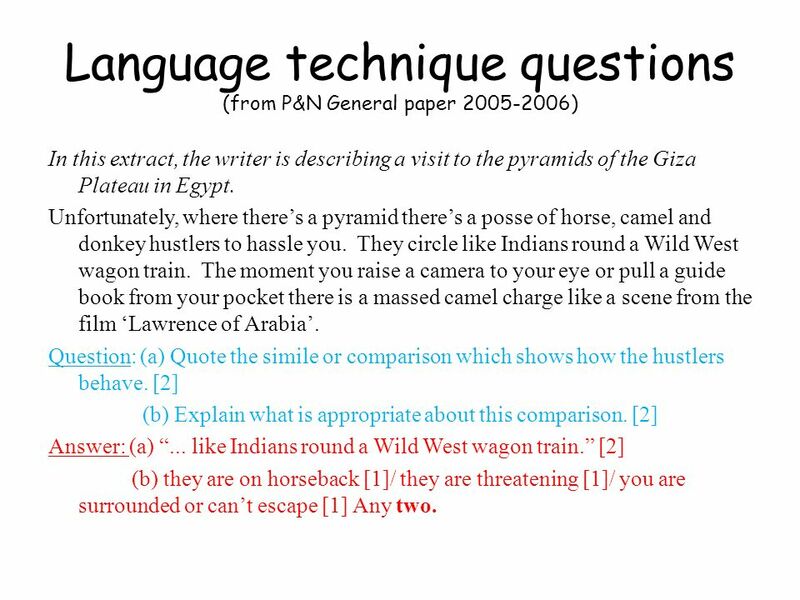 14 Language technique questions (from P&N General paper 2005-2006) In this extract, the writer is describing a visit to the pyramids of the Giza Plateau in Egypt. Unfortunately, where theres a pyramid theres a posse of horse, camel and donkey hustlers to hassle you. They circle like Indians round a Wild West wagon train. The moment you raise a camera to your eye or pull a guide book from your pocket there is a massed camel charge like a scene from the film Lawrence of Arabia. Question: (a) Quote the simile or comparison which shows how the hustlers behave. (b) Explain what is appropriate about this comparison. Answer: (a)... like Indians round a Wild West wagon train. (b) they are on horseback / they are threatening / you are surrounded or cant escape  Any two. 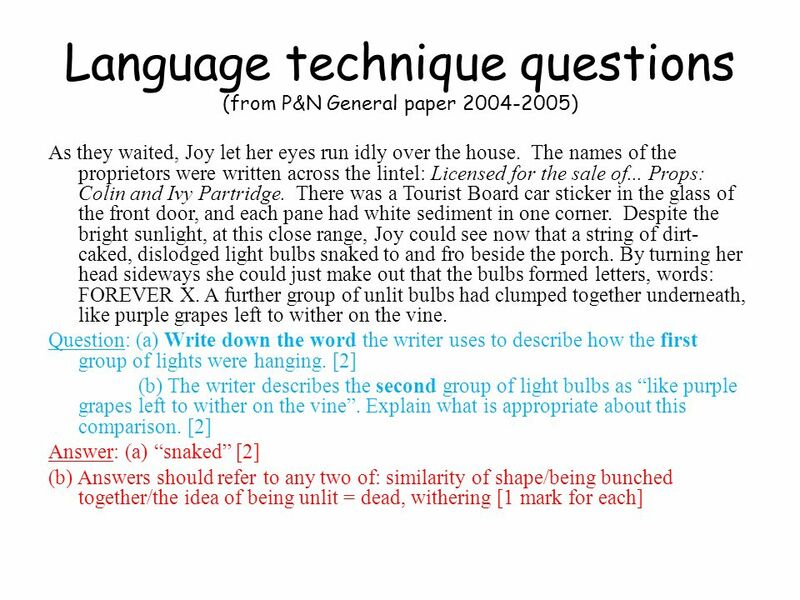 Download ppt "Close reading Revision tips – Part 2. 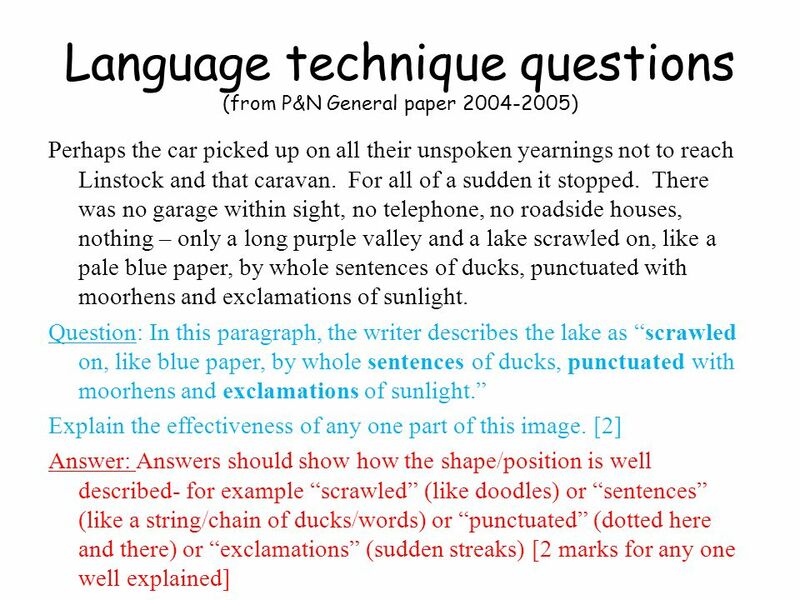 Reminder Apart from understanding and sentence structure questions, you will be expected to answer questions on." Living. black eat short United States run book. The book “Alice in Wonderland” is not only remarkable for its narration, which is vivid, informative and interesting. One of the most important and interesting. IT DOESN’T END By Amreeta Singh. Page 1 “Uh ow, not again. OUCH.” I never knew riding a horse would be so painful. It was a piping hot morning. Or should. Improving descriptive writing There was a noise of a train. I see a ray of light slanting in through the glass. There was a noise of a rat in the corner. Commenting on Word-Choice and Unpacking Metaphors. Making an Inference Reading Between the Lines. What Is an Inference? An inference is something that you conclude based partly on evidence and party on. HELBOR ZENOR KAOS sent you and your partner On a quest. EastEast WestWest You see a very peaceful land around the edge with butterflies. You see a.